Gigabyte has introduced the S1082 and S1185, two new tablets, which are equipped with an Intel Ivy Bridge processor, a Full HD display and Windows 8. Gigabyte has announced two new Windows 8 equal tablets that are to come within the next few weeks on the market. The Gigabyte S1185 has a Full HD display with a resolution of 1920 × 1200 pixels. They include an Intel Ivy Bridge processor hiding with 4GB memory and various storage options. Particularly interesting is the Gigabyte S1185 is due to an optional keyboard that is attached by magnets to the tablet. 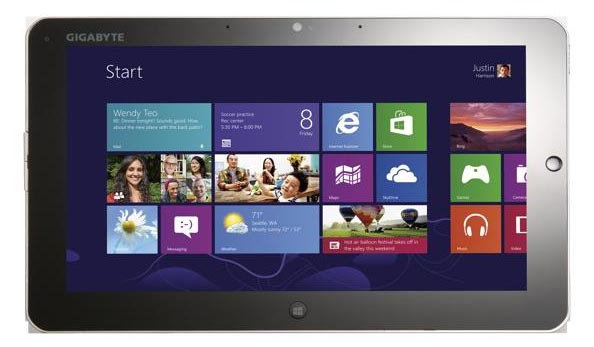 The Gigabyte S1185 has all the ports that you could want from a current Windows 8 tablet. This of course includes a USB port and a VGA and HDMI output. There are also two cameras and an optional mouse. Ultimately, the Gigabyte S1082 with the S1185 is the same, but should concentrate more on business customers. Also, the S1082 has thus a Sandy Bridge processor and a 10.1 inch Full HD display. In this case, however, you can choose between an SSD and a normal large 500GB hard drive, especially if you need a lot of memory. In addition, the Gigabyte S1082 is equipped with UMTS / HSDPA, so you are not only dependent on WLAN. Gigabyte was in Germany so far, both with convertibles, as well as netbooks not so very successful. This is simply because that device from Gigabyte are often widely available. It is also highly unlikely that these two Windows 8 tablets will be successful. Therefore, the competition is just too great.